Aster Dwarf Milady Mix Callistephus Chinensis is a compact, half-hardy, flowering annual plant. Also commonly called China Aster this dwarf, robust, bushy annual is very easy to grow from Aster seeds, and fast growing Aster Milady begins to bloom in mid summer producing large, globular flowers in white, rose, lilac, scarlet and blue. The fragrant blooms appear until first hard frost making a fantastic display and attracting butterflies and bees. 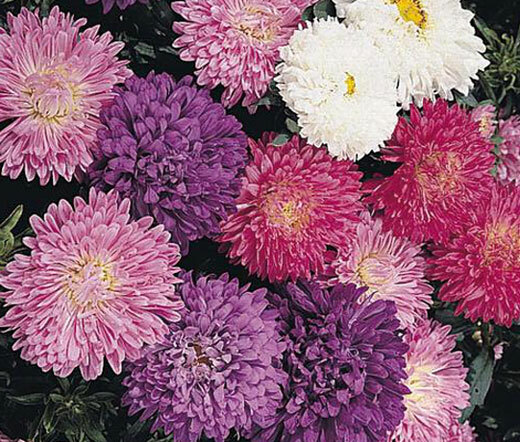 China Aster Milady is a low-growing and bushy plant that is perfect for sunny borders, flower beds, containers, pots and window boxes. Callistephus Chinensis performs best in full sun or partial shade and likes moist, well-drained soil requiring moderate watering. Aster Milady is an excellent, long-lasting cut flower for floral arrangements.